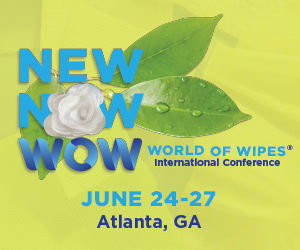 Recognized within the global nonwovens and engineered fabrics and related industries as the associations that consistently provide products, services and events of the highest value to members and industry participants worldwide. Provide thought-leadership and industry competitiveness through the stimulation and innovation and sustainability, recognition of excellence and recording of industry activity. Create positive awareness and trust for the industry and its products by speaking with one voice in active product stewardship, protecting markets that are important to our members. Facilitate industry consensus on issues of common interest and be the industry’s voice in representing the industry’s position. Promote free and fair trade for the benefit of members and consumers through involvements in, and shaping of, the regulatory and market enviornments with special emphasis on the harmonization of global standards. Advance member’s commercial interests via face-to-face interaction through industry expositions and events. Enhance member access to new markets through actionable data, international cooperation and outreach.